Upper: Engineered mesh, inner sleeve, Flywire assisted lacing. 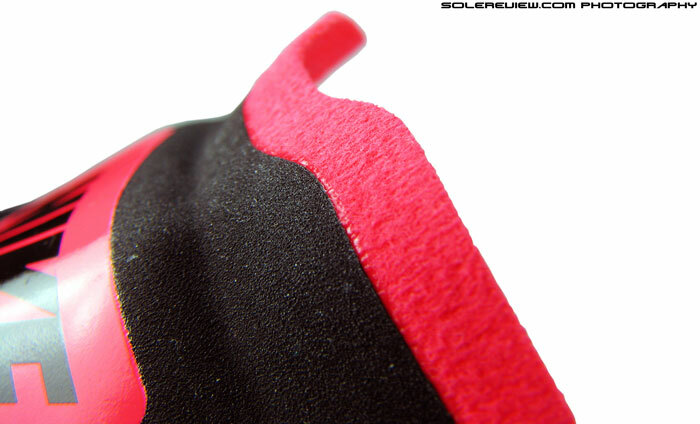 Outsole: Thin sheet of carbon rubber. Widths available: Single, D - regular (reviewed). 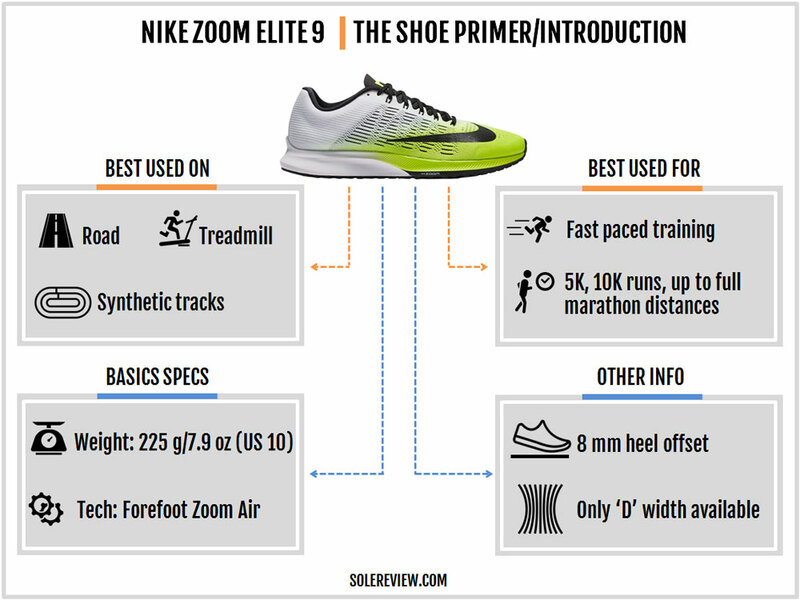 The Zoom Elite 9 maintains kinship with the Elite 8 only in name; everything else is brand new. The softer ride makes the Elite 9 far more versatile, and it sheds a staggering 2-ounce of weight. 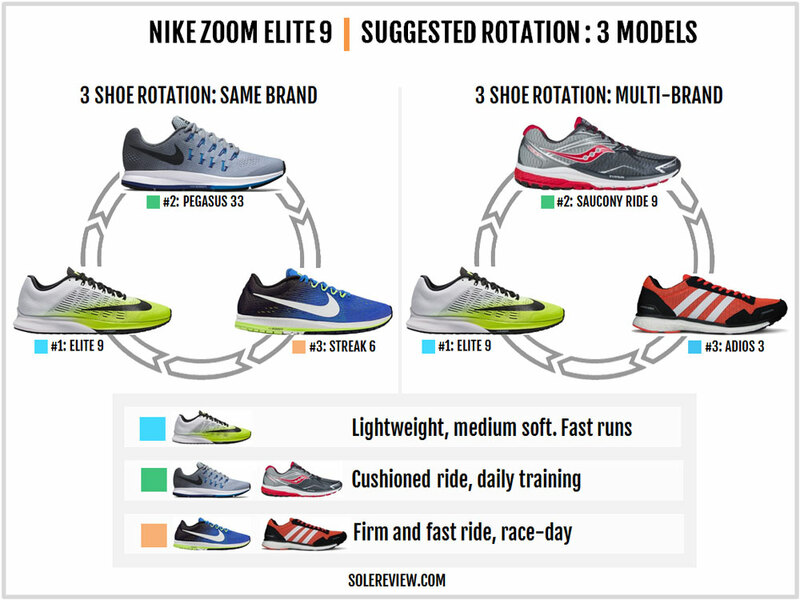 Few models in Nike’s product line have been recipients of numerous design overhauls like the Zoom Elite. 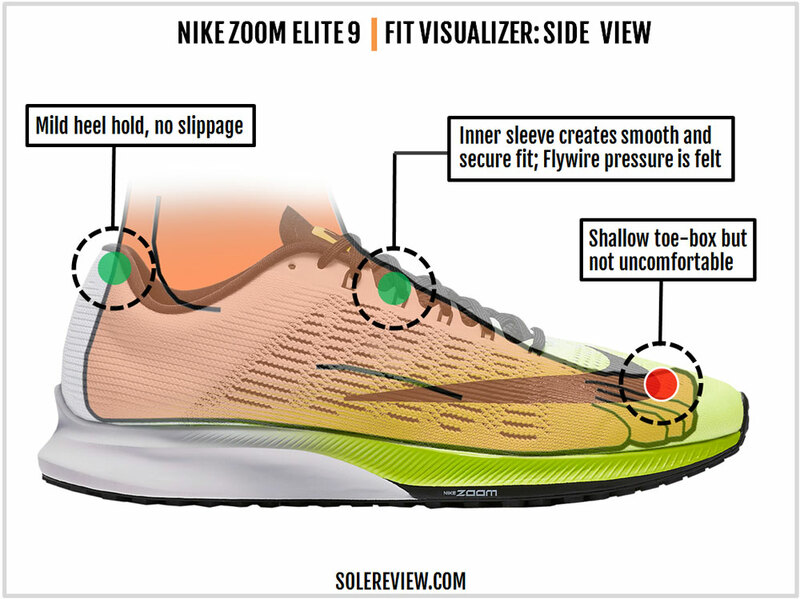 The Elite 6 morphed into the relatively unrecognizable Elite 7 and 8; this year, the Zoom Elite 9 is based on a brand new template resulting in a completely different running experience. The idea behind the Zoom Elite is that of a fast-paced trainer with a more forgiving ride than a minimal racing flat. All the Zoom Elite versions have been based on this brief, but then there are various ways of interpreting it. 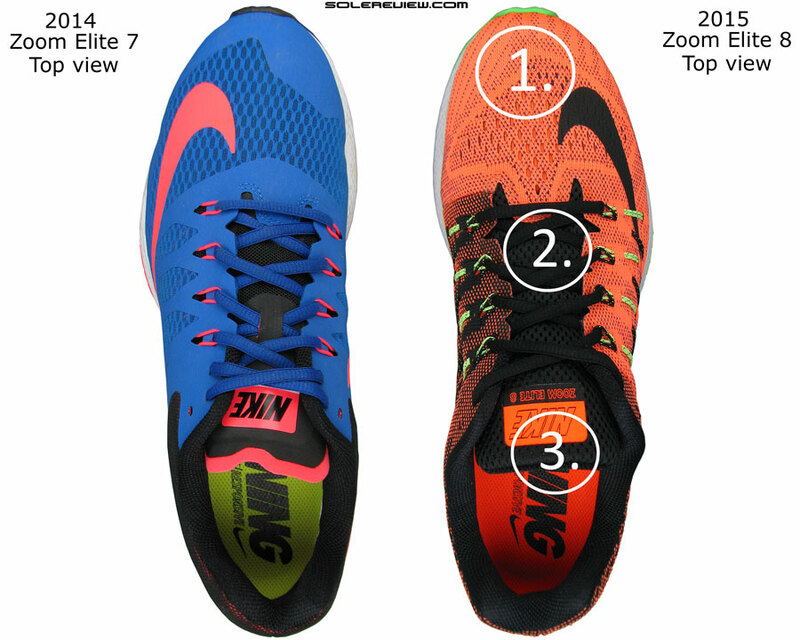 Take the Zoom Elite 7 and 8 for example. Both shoes had a very firm ride favoring forefoot strikers. 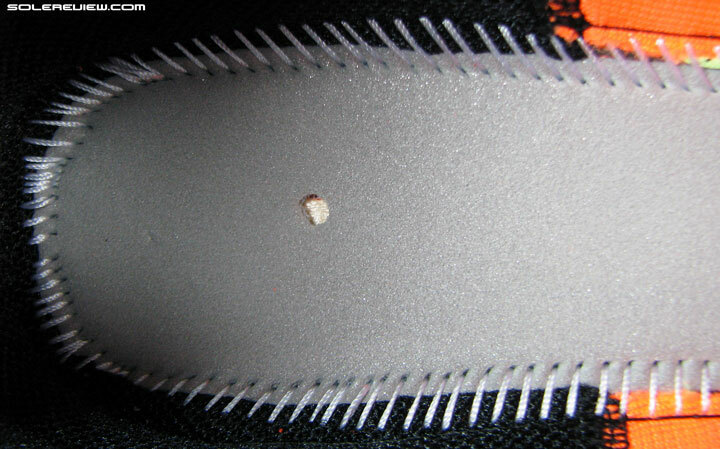 The rearfoot was a hard block of foam whereas the forefoot had a Zoom Air bag placed above a soft blown rubber outsole. 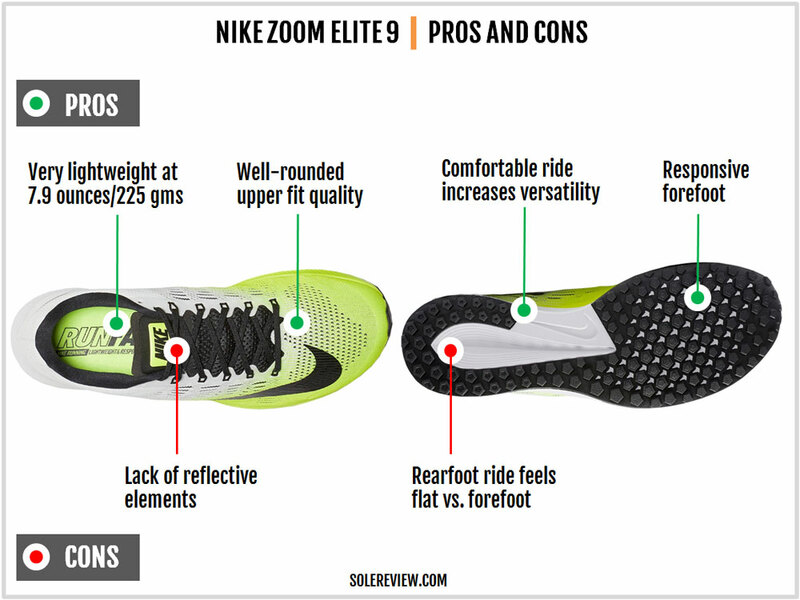 The skewed distribution of cushioning between the rearfoot and forefoot made the Elite 7 and 8’s use-case very specific. 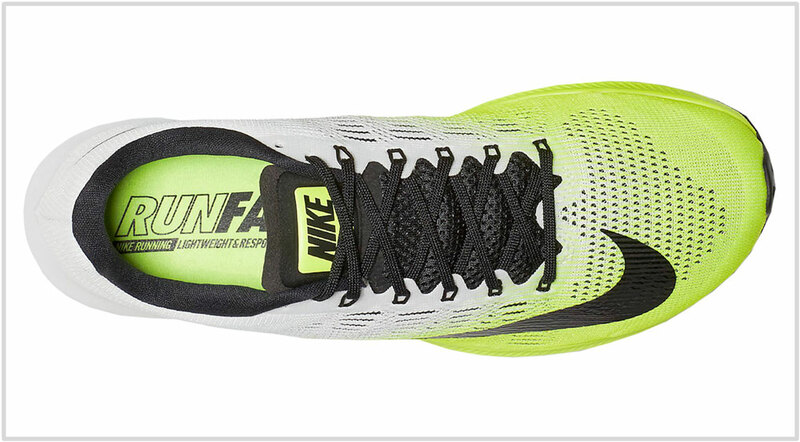 It was great for running fast, and even better if you were a forefoot striker. But if you were a rearfoot striker buying the Elite for leisurely runs, then it was hard to realize the shoe’s full potential. A blunt way to put it is that the Elite 7 and 8 were out of bounds for heel-strikers. That changes with the Zoom Elite 9. At 8 ounces, not only is it significantly lighter, but the ride is much softer. The upper fit receives a chunk of updates too, and as a sum of parts, the new Elite is far more versatile and likely to appeal to a larger group of runners. The Elite 9 is also better aligned with the rest of Nike’s assortment. The earlier Elites were very distinct from a ride perspective. In contrast, the Elite 9 feels halfway between the Zoom Streak 6 and the Pegasus 33, both in ride and upper fit experience. There are a couple of fundamental changes made to the Elite 9. The midsole ride is softer overall, as the new midsole is made of the Cushlon EVA foam variant. 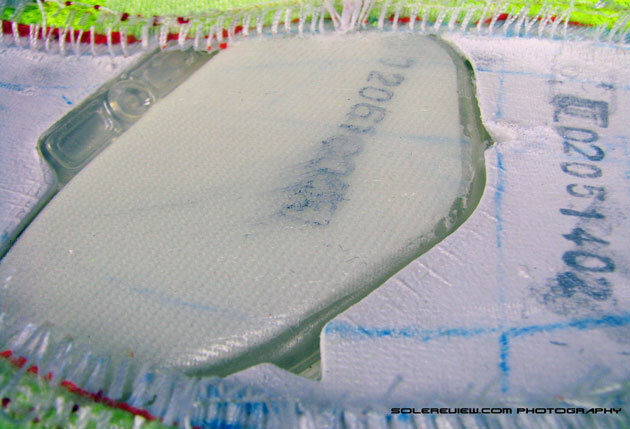 Additionally, the outsole underneath is thinner and softer, altering the ride character in the process. 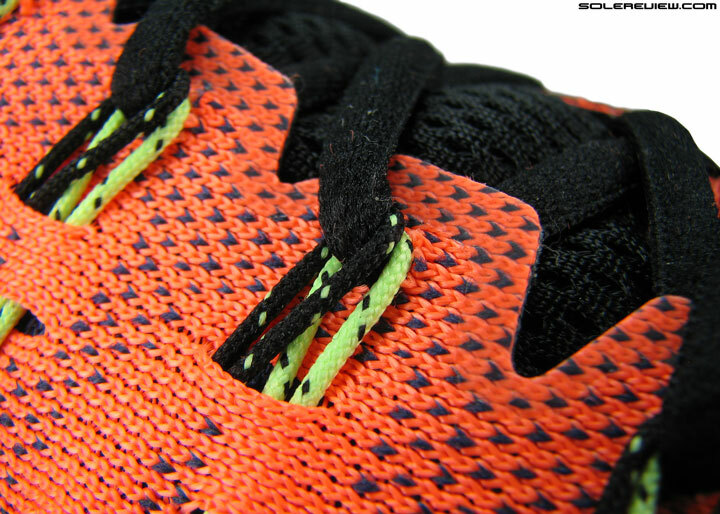 The upper is based on the Zoom Streak 6 last, which results in a similar fit quality. 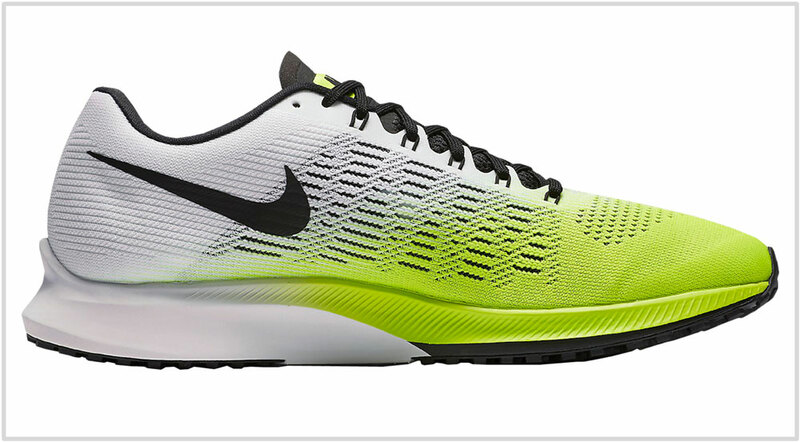 That makes the Elite 9 a muscled-up version of the Streak, while the softer ride is a tie-in to the Pegasus 33. In short, the core persona of the Elite has changed. 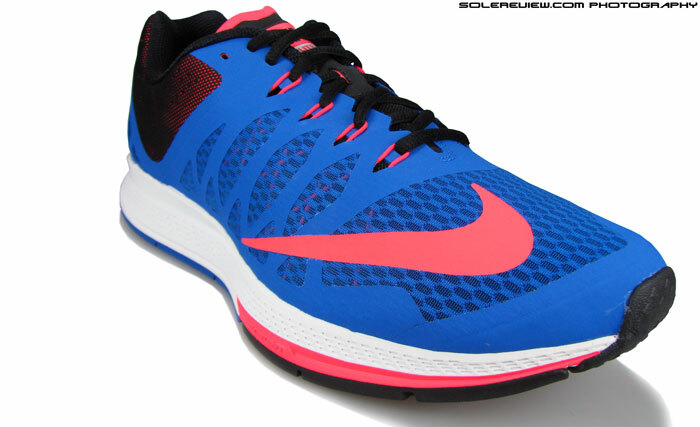 Depending on your view, the Elite 9 is either a cushioned Streak 6 or a low-calorie Pegasus. It offers greater cushioning protection over the Streak 6, and yet the Elite’s sub 8-ounce weight provides a significant speed advantage over the Pegasus. We’ve seen some versatile running shoe introductions in 2017. Saucony pulled out the Freedom ISO from its hat, and now we have the Elite 9. 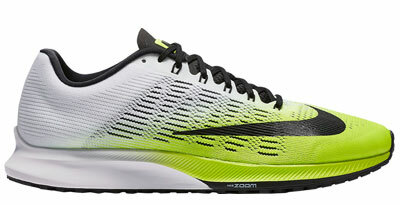 The Nike Zoom Elite 9 now has a higher sense of belonging within the cushioned pacer assortment. Whereas the Elite 8’s ultra-firm ride turned it into an odd-man in the crowd, the softer and lighter Elite 9 is an easier comparison with the rest. The adidas Boston 6 serves the same purpose as the Elite. The Boston is great for fast runs while providing ample cushioning and responsiveness; the only difference is that the Boston has a rearfoot biased cushioning vs. the Elite 9’s feature rich (Zoom Air) forefoot. Asics Dynaflyte would have been a closer match if it was lighter and slightly less expensive. The firmer Flytefoam midsole mated to a minimal upper makes it suitable for fast-paced training, though it weighs nearly two ounces over the Elite and $20 more expensive. Skechers’ newest GoMeb Razor is a speedster worth a second look. It weighs similar to the Elite and is differentiated by a firmer ride, 4 mm heel offset (vs. the Elite’s 8 mm) and a knit upper. There are other models which are comparable to a certain extent, like the the Mizuno Sayonara 4, Brooks Hyperion, and the New Balance Zante V2. The Elite 9’s upper is based on the Streak 6’s last (fit) and visual template. The outer upper is a single piece of lightweight and breathable engineered mesh with no additional layers. The Zoom Elite’s upper has turned progressively minimal over the years; the Elite 7 had lots of fused synthetic, and the Elite 8 went for a cleaner Flymesh aesthetic. The Elite 9 travels further in its quest for minimalism, and this becomes obvious when you take a good look at it. For example, the heel has a partial inner counter instead of a full-sized component. Also, the mesh used for the upper is thinner than the Elite 8. Just like the last model, the toe area is propped up with an internal stiffener/bumper. There are no layers over the lacing eyestay, and instead, a fused laminate is used to strengthen that area. The tongue is sleeved as it used to be, but the design reverts to the flat flap design of the Elite 7, with soft edges to prevent chafing. 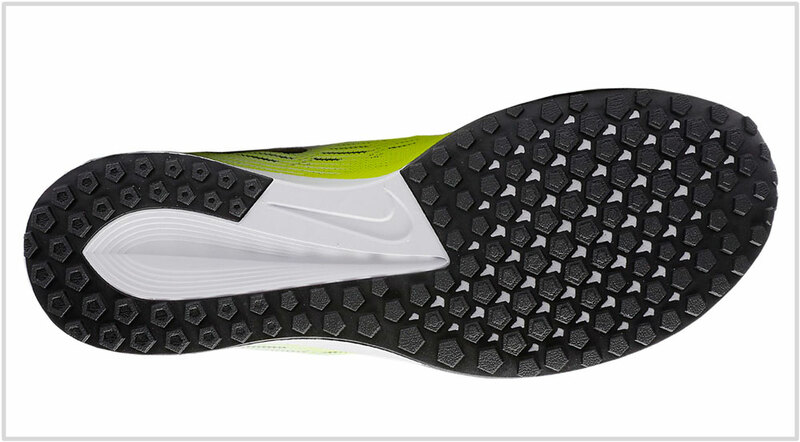 On the Elite 8, Nike used a foam-filled tongue similar to what you’d normally see on a Pegasus. The Elite 9’s laces are a part of the new feature list. The earlier Elites used regular, round laces; what you get on the 9 is a thinner, flat lacing system. In our opinion, the new lacing is an improvement over the Elite 7 and 8 and better suited to the Elite 9’s personality. 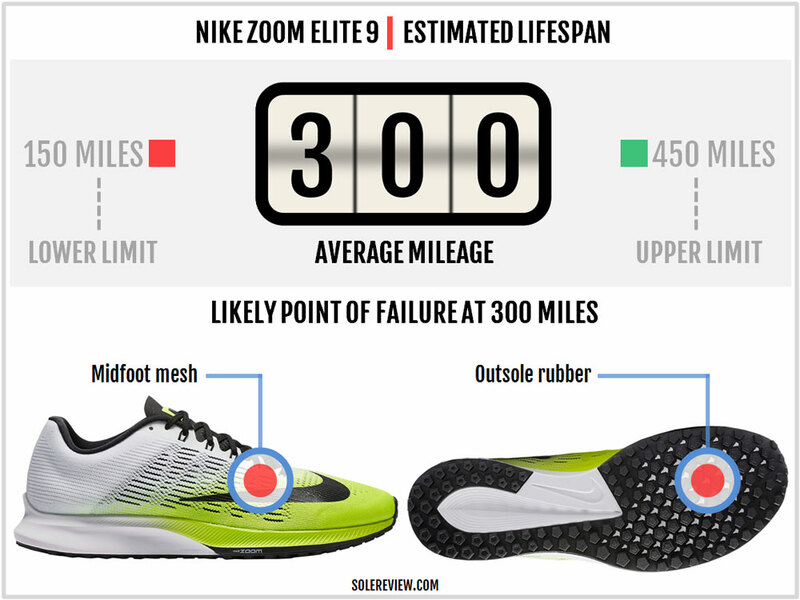 Unlike the Streak or Lunaracer, the Elite 9 does not use a midfoot strapping system. Instead, it relies on the cord-based Flywire. The Flywire strings are situated between the outer upper and the internal sleeve. We risk sounding like a struck record by saying that the string-based Flywire isn’t great, and the Elite 9 could have been better off with the strapping system or the hybrid used on the Vomero 12. The Flywire used on the Elite 9 isn’t uncomfortable or anything, but still. Nike mentions that the Elite 9 has asymmetrical lacing offset to one side. Truth be told, it is barely noticeable on the Elite, whether visually or functionally. The Elite 7 had lacing which was skewed to one side; the Elite 9’s asymmetry is relatively mild and visually indiscernible. Footwear aesthetics tends to be a personal thing, but we like what Nike has done with the Elite 9. The matching of color sublimation (colors fading from strong to light) of the upper with the midsole gives the Elite a ‘speed’ look. The large printed Swoosh logo on the forefoot also blends well with the overall theme. One change (over the Elite 8) which becomes quickly obvious is the softer midsole density. The foam material is now Nike’s Cushlon EVA, which turns the Elite 9’s cushioning softer. Stuck to the shoe’s underside is a Carbon rubber outsole which is thinner and softer than before. 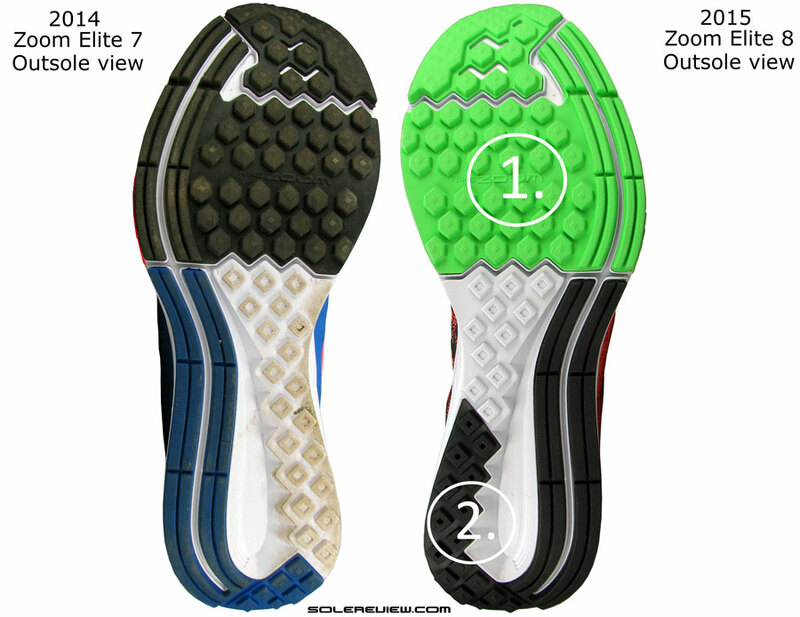 The overall coverage is similar to the Elite 8; except for a small portion under the inner midfoot, the rest of the surface is layered over with rubber. A colony of pentagon-shaped lugs cover the surface, and these are agents of excellent traction. A key update is that the new outsole is a single component instead of the ZE8’s three-piece design, and any flexibility comes from the thinness of the outsole instead of flex grooves. Either way, the forefoot is stiff due to the presence of a pressurized Zoom Air bag inside. Besides the softer foam, there’s another update which makes the ride softer. The heel no longer has the cardboard which made the rearfoot hard on the Elite 7 and 8. Nike had been using a cellulose board on many of its shoes (including the earlier Vomeros), and it is only recently that they have eliminated its usage. The combination of the thin outsole and racer-like upper makes the Elite 9 extremely lightweight. It loses two ounces over the Elite 8, bringing down the weight to a pleasing 7.9 ounces. To put this in perspective, that’s just an ounce over the Streak 6! The weight also feels well distributed throughout the shoe due to the lightweight build of the midsole and outsole. Because of this, the Elite 9 feels lighter than its actual weight. The lightweight built does not get in the way of the Elite 9’s lifespan. While you can have to accept the fact that the thin-soled Elite 9 isn’t going to be as durable as the older Elite models, there won’t be sudden (and unpleasant) surprises. Long-term ownership will bring with it a gradual wearing of the rubber outsole and an age-related decrease in the EVA foam’s cushioning properties. For now, we don’t foresee any (pre-mature failure) problems with the upper. If we receive adverse reviews of the mesh upper in the future, we’ll update this section. There is a sense of spatial economy inside the Elite 9’s upper. The toe-box swoops low, but at the same time, you don’t experience the sensation of your toes pinned down to the insole. Everything about the Elite 9’s upper fit has a ‘need-only’ feel, rather than a gratuitous abundance of interior space. Having an inner sleeve always bodes well for the quality of midfoot fit. The insides feel smooth and seamless, and the thin tongue works hard at filtering lacing pressure. The tongue feels more minimal than the Elite 8; this comes as no surprise considering the design update. The new Elite has a thin tongue which replaces the 2016’s padded version. The heel counter fit is Lunaracer-esque. By that, we mean that it doesn’t hold the ankles in a vice-like grip, yet provides enough support and padding. The stiffener placed inside is small in size, so the upper portion is somewhat pliable in nature. 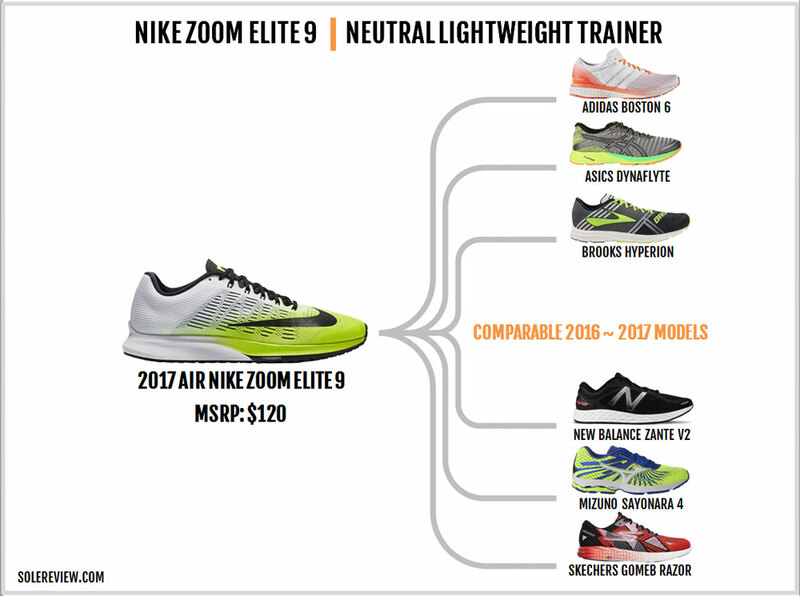 The Elite 9’s fit has a strong Zoom Streak 6 pedigree. After all, both are based on the same last, a factor which determines the fit of a shoe. The Elite 9 fits snug all around like a racing flat, but without uncomfortable hot-spots. This newly acquired upper fit is very different from the Elite 8’s interiors. Both the ZE7 and ZE8 had an upper more consistent with that of a daily trainer like the Pegasus. Not so this time; the Elite 9’s upper has a very racer-like vibe to it. We’d recommend going true-to-size on the Elite 9, but if you want the upper to feel like the Elite 8 or the Pegasus, then buying a half size larger should accomplish that. There’s a Goldilocks zone between the Pegasus’s cushy ride and the Streak’s firm flatness, and the Elite 9 fits right there. The midsole foam, the Zoom unit, and the thin outsole add softness to the Elite 9 ride, and yet provides a pleasing balance between soft cushioning and racing flat frugality. The Elite 9 is the ideal choice for fast-paced (4.45 mins/km and faster) workouts as well as races. For longer distances where you want the ride economy of the Streak 6 but don’t want your feet beat up, then the Elite 9 is just the shoe. That said, running leisurely speeds in the Elite 9 also works perfectly well. We say this because this wasn’t the case with the Elite 8’s super-hard heel cushioning. Running slow in the Elite 8 was punishing; in contrast, the Elite 9’s softer (and board-free) midsole is far more versatile. The Elite 9 is equipped with a forefoot-only Zoom, so most of the shoe’s responsiveness is packed in the front. Forefoot strikers will get the spring-like feedback from the Zoom bag; rearfoot strikers not so much. This split behavior was true for the earlier Elites as well, and it hasn’t changed this year. 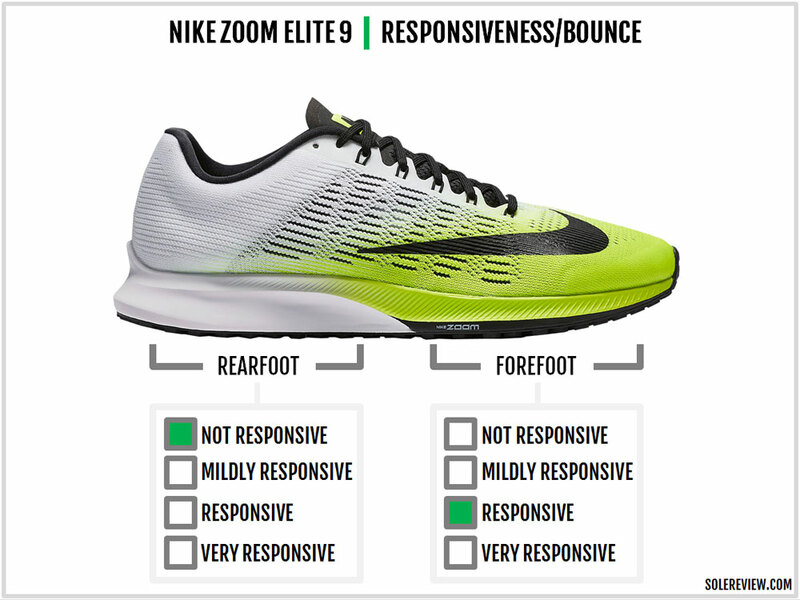 The cushioning is softer than before, but that doesn’t change the responsiveness levels under the rearfoot. However, the changed sole design increases the forefoot responsiveness. The softer foam surrounding the Zoom Air bag allows better compression, and this is further helped by the thinner outsole. 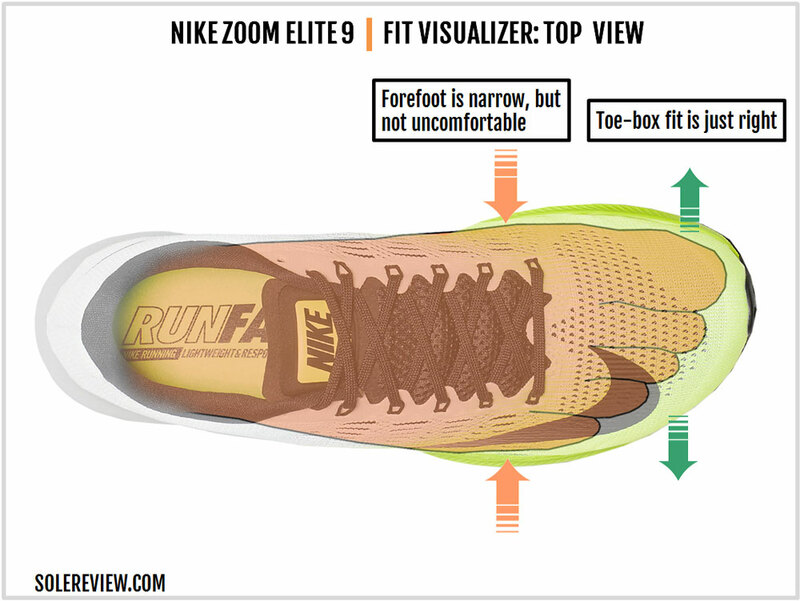 Hence, one can extract greater responsiveness from the Elite 9’s Zoom Air unit compared to the previous Elites. The relatively wide and firm forefoot produces a planted ride which feels supportive. In the rear, the Elite 9 feels slightly less supportive than the 8. You see, the midsole base under the rearfoot is narrower and softer than the Elite 8. Thus, there’s higher compression or lean on either side. This isn’t a negative, but a difference which needs to be pointed out. Transitions are smooth on the Elite 9, though not of the same level as the Streak 6. There’s a cavity under the heel which keeps the foot centered, so all’s good. 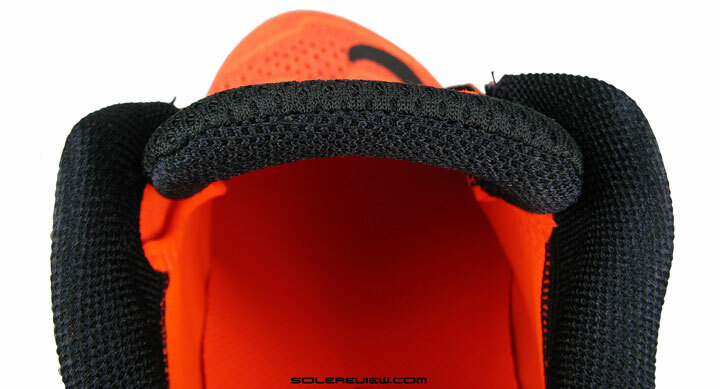 The Streak has a plastic midfoot plate which increases transition efficiency. The Elite 9, as befits its middle-ground (between the Pegasus and Streak) status, forgoes this feature. The Elite 9’s biggest strength is its ability to feel like racing flat without actually being one. The sub 8-ounce weight brings the Elite in striking distance of racing flats, and yet the well-cushioned midsole gives it the versatility of a daily trainer. The mesh upper disappears over the foot during runs and provides a snug fit without causing discomfort. The Flywire is felt on the sides, but the inner sleeve creates a smooth interior environment. Increasing the midsole softness provides the Elite 9 with an extremely versatile character. It feels light and fast enough for races while offering adequate cushioning for runs of a higher mileage. Transitions feel smooth, and the outsole grip is great. While there aren’t any deal-breakers to speak of, the Elite 9 would be better off with the string-type Flywire gone and increased reflectivity. Within a three-shoe Nike rotation, the Elite 9 hooks up perfectly with the Pegasus 33 and the Streak 6. Pick the Pegasus for days when you need the extra cushioning; and for occasions like 5 and 10 k races, lace up the much lighter Streak 6. And the Elite 9 allows you to rack up speed miles without your feet taking a beating. While it lacks the long-term durability of the Pegasus, you can use the Elite 9 as a daily training shoe. As a non-Nike option, we’d have recommended the adidas Glide, but for the 9th version’s significant bump-up in ride softness. So in lieu, the Saucony Ride 9 plays the role of the cushioning trainer well. The adidas adizero adios 3 has proven to be a well-padded raceday shoe. At 8-ounces, it isn’t the lightest racer around but makes up for that shortcoming with a cushioned ride and durable outsole. 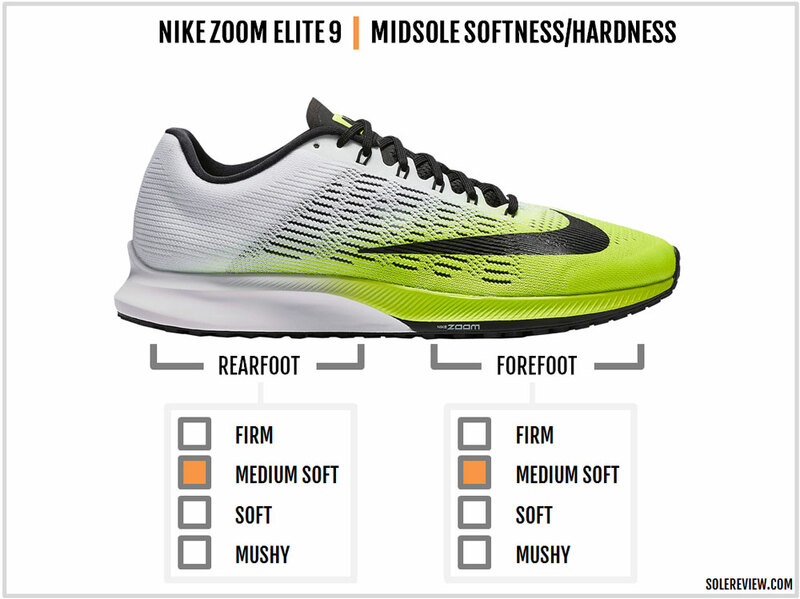 The Zoom Elite 9 is a completely different animal than the Elite 8. The new model is significantly lighter, and the midsole is softer too. The shoe sheds over 2 ounces of mesh, foam, and rubber while softening the foam density. 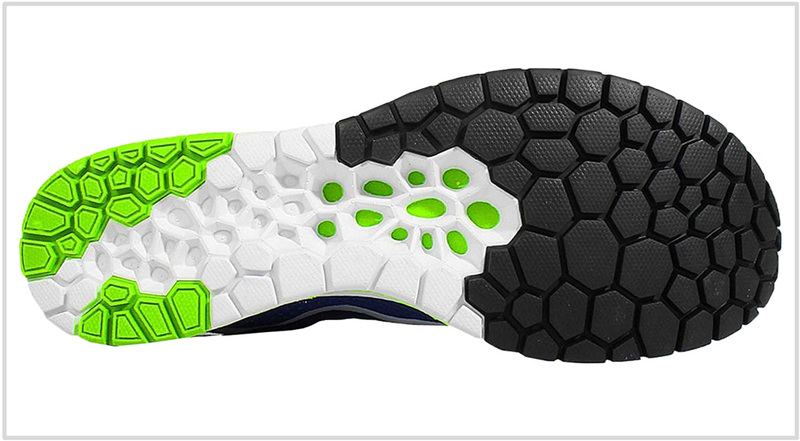 The rubber outsole is thinner and softer overall, which contributes to the Elite 9’s transformed ride quality. There’s a slightly negative impact on rearfoot stability. The Elite 9 removes the cellulose board stacked above the Elite 8’s firmer midsole, and the new midsole has a narrower base. 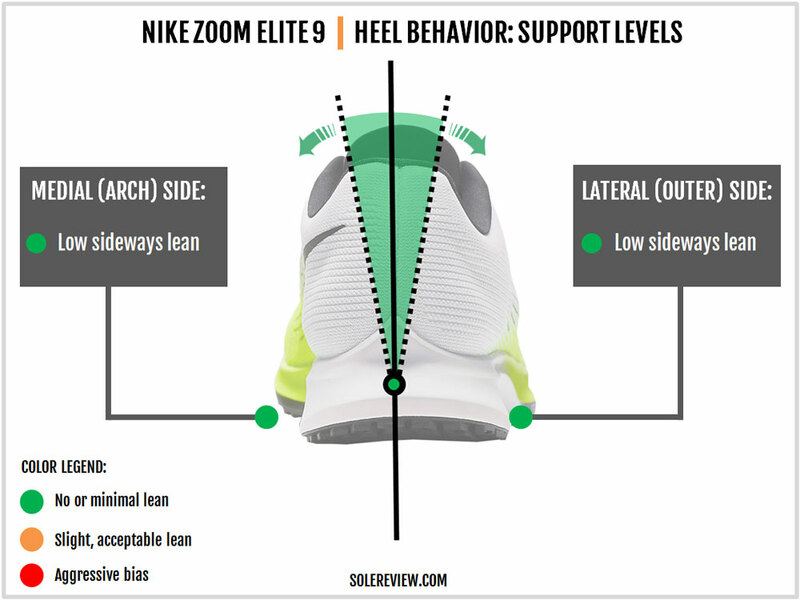 Consequently, the heel isn’t as supportive as the Elite 8’s design. The new upper is smoother and lighter on the foot. The Elite 9’s upper is relatively deconstructed, using a thinner and more breathable mesh vs. the thicker Flymesh of the Elite 8. The Flywire cords feel closer to the foot, because they are – the strings are now between the outer mesh and the inner sleeve, compared to the (mostly) external placement on the Elite 8. The tongue leaves the Elite 8’s conventional design behind and opts for the thinner version used on the Streak 6 and the Elite 7. 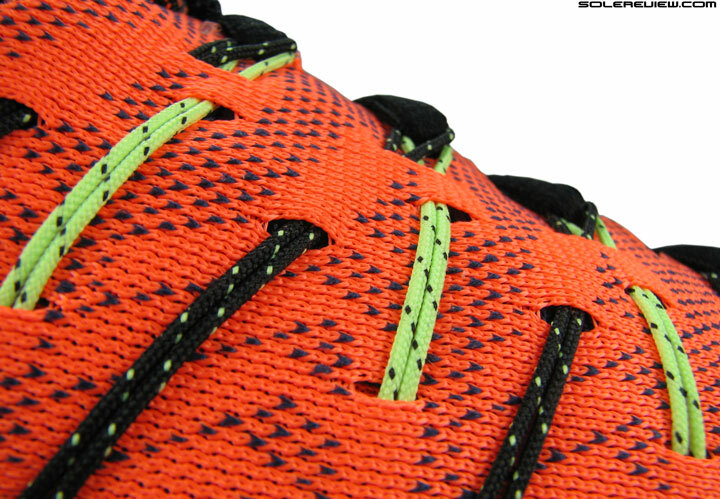 The laces are better too, and the mesh has increased ventilation over the ZE8. 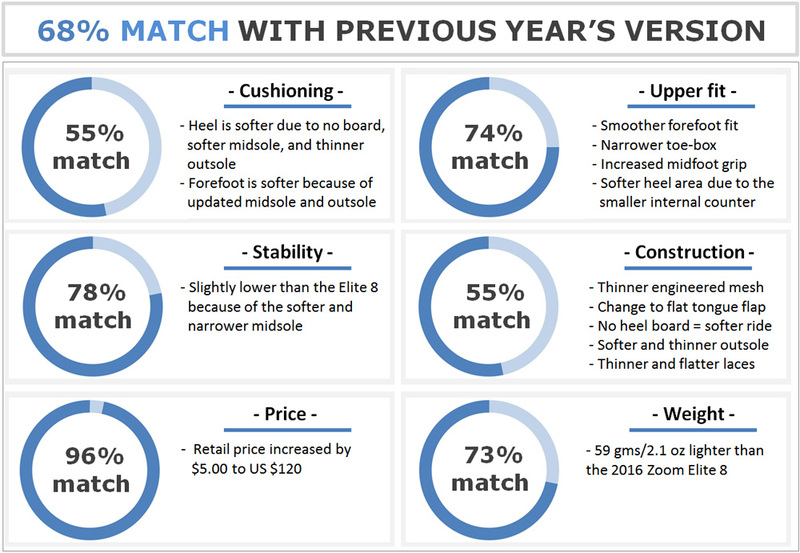 A $5.00 increase in the Zoom Elite’s MSRP has been the trend for the past three years. The Elite 7 was $110 and went to $115 for the 8. Add another $5.00, and you have the $120 Zoom Elite 9.